Bridges at San Felipe Street and Westheimer Road that cross a drainage ditch formally identified as W129-00-00 in the Galleria area are expected to be completely or partially closed temporarily in spring 2012, weather and construction schedule permitting. Changes in the construction schedule have delayed the expected bridge closures from previously published dates. The Harris County Flood Control District will establish detour routes that will aid in the flow of traffic during the bridge projects and will provide an advisory to area residents, the media and other interested parties closer to the time of bridge construction. The bridges will be reconstructed as part of the Flood Control District's W129-00-00 Conveyance Improvements Project. (See attached project area map.) 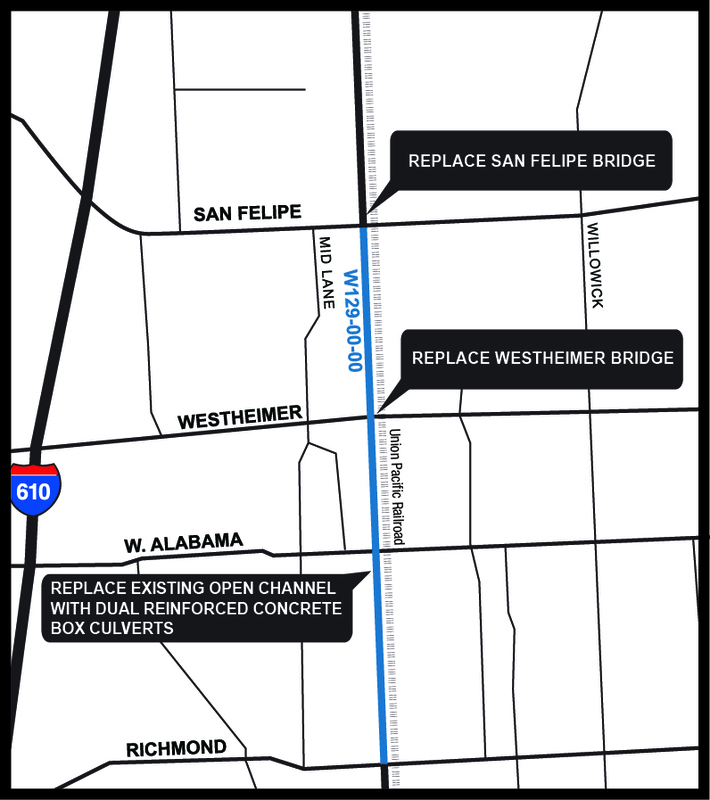 The bridge reconstruction projects will require all lanes on the San Felipe bridge to be closed for up to two weeks and traffic flow on the Westheimer bridge to be limited to one lane in each direction for up to a month. The project is rebuilding and enclosing a section of the drainage ditch, which runs adjacent to the Union Pacific Railroad tracks just inside West Loop 610. In August 2011, the Flood Control District began this $13.2 million capital improvement project to improve the flow of stormwater. This particular phase of the project spans from San Felipe Street to Richmond Avenue and includes the demolition and replacement of the two 50-year-old bridges.